This Snugpak Scorpion 3 tent review is about a freestanding and incredibly reliable cold weather tent with top quality poles and huge waterproof rating. Tent for cold weather and winter camping. One door and one vestibule. This tent is on Amazon and the price is far lower than on the manufacturer’s site, so follow the link and benefit from their efficient shipping service. This is a structure with external poles, so you pass them through the sleeves and attach to the corner grommets of the fly itself. So this is what they call fly-first pitch tent. But this alone would not keep it up. So there are straps on the ground that keep the two sides of the tent together. Therefore the poles raise it up and the ground straps prevent the structure from spreading out. This is a double-layer structure, and here this should be taken literally because the inner tent is a taffeta with just a few small mesh sections. You attach the inner tent after you have raised up the tent. 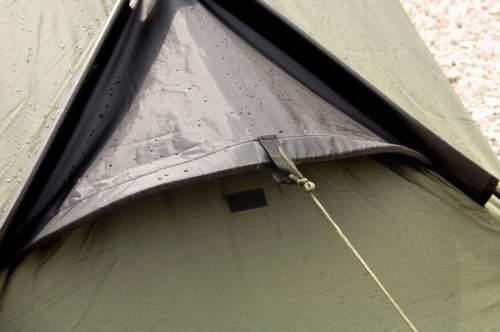 There are numerous rings on the fly on its underside and also toggles on the inner tent. The inner tent also attaches to the poles on the ground where you have buckles. 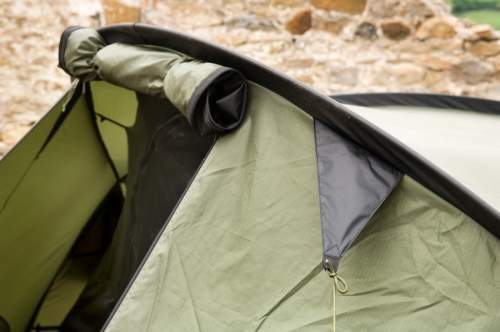 Once you have attached the inner tent, you can keep it pre-attached when you pack the tent. So next time when you set it up, the inner tent is protected even if you are doing this in the rain. The mentioned design of the fly with those straps on the ground, you have a fast-fly variant of a particular type. Normally a fast-fly setup is with the help of a footprint which serves as a base to keep the poles in place when you connect them to the grommets on the fly. But here you do not have a footprint and do not need it for such a setup. With such a setup you certainly would not use this tent for a cold weather camping, but I thought you might want to know that such an option exists here because it has not been mentioned by the manufacturer. They do not provide the data for the area, but you clearly see that what they suggest is unrealistic. In fact, I have calculated the inner area for you and it is around 35.5 ft² (3.3 m²). So in the case of three users this would mean 11.8 ft² (1.1 m²) per person. But see also the shape of the area to realize that this is very difficult. 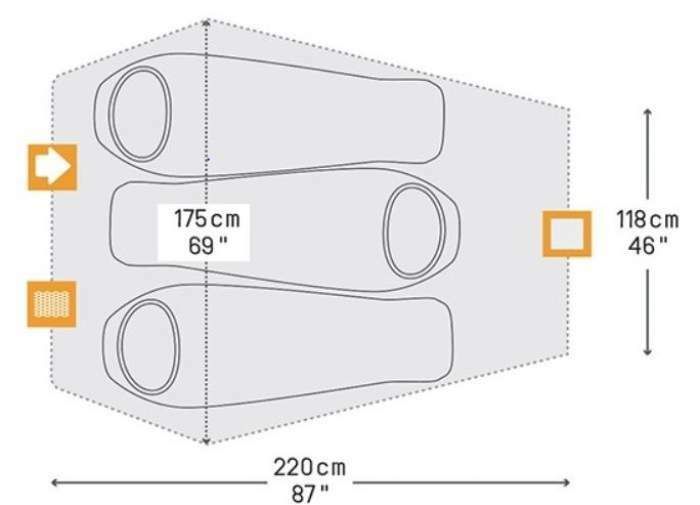 The tent includes also a front vestibule, from the dimensions given in the floor plan below, you can estimate that its area is just above one square meters. So this is a tent for two people only. Seasons-wise & climate-wise, this tent can be used in all seasons in the sense that it offers full protection from elements. But this does not make it the best choice in a warm climate. It is best suited for a cooler environment and you can use it also as a winter tent. The poles cross each other at three places so the structure is very strong and stable. But the poles are outside and they create an area on the top which would keep the snow accumulating, it simply cannot slide down the fly. So in the case of lots of snow, it could crash. Nevertheless, I have added it to my list of best winter camping tents. There are vents for air circulations, the fly is full coverage type, the structure is low and it will perform well in the case of a windy environment. The waterproof rating is huge and you will be protected from the rain and from the groundwater. Note also that the inner area is very dark, this is because of the black inner tent and the dark-gray fly and you can sleep longer in the morning without much glare. 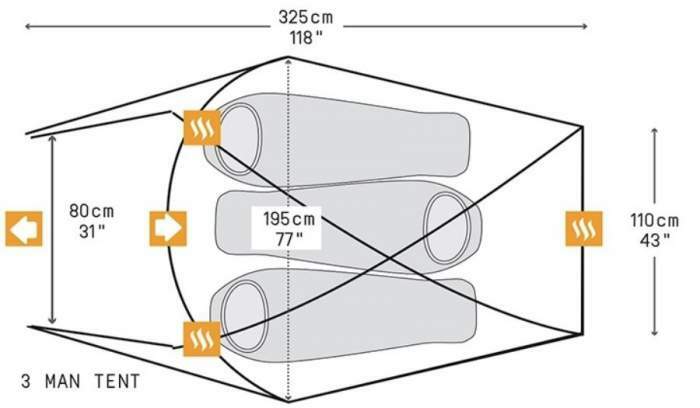 So the tent looks like a dark-rest tent (or lights-out as some call such tents), but this feature is not mentioned as a fetaure by the manufacturer. Weight-wise, with its 7.5 lb (3.4 kg) this is a lightweight tent for such a cold-weather structure. But you will see below in the comparison table how it stands in comparison with some competitors. The packed size 17 x 8 inches (43 x 21 cm) is also very good. So this tent can be carried on the trails, and you can easily transport it on a bicycle and a motorbike. You have excellent stuff here wherever you look, so see more what it offers. There are 3 DAC Featherlite NSL anodized aluminum TH72M poles with press fit connections. This is a 7000-series aluminum DAC proprietary alloy developed for resistance to what is known as stress corrosion cracking (SCC). Two poles are of the same size and one is shorter. Note that NSL means just ‘new sleeve’. So this is the best you can have, these poles were developed by DAC for expedition tents. 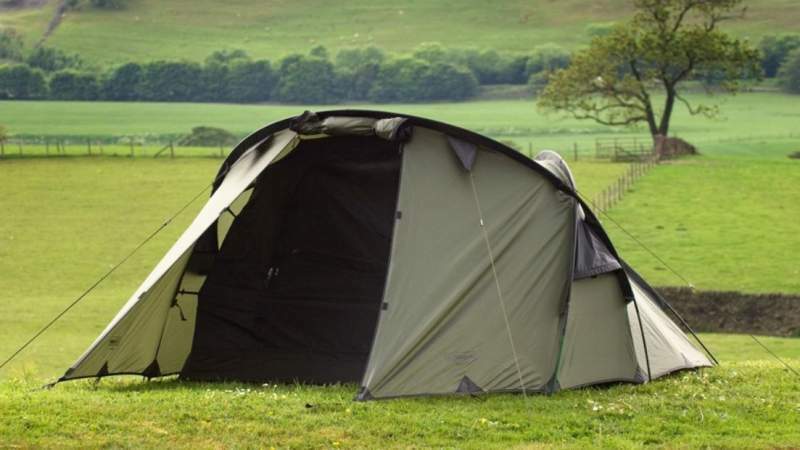 The tent comes with 18 lightweight alloy cross-stakes, with two-spares. The fly is robust 210t ripstop polyester with 5000 mm waterproof PU coating. The floor is 190t nylon with 5000 mm PU waterproof rating, bathtub style. The inner tent is a 190t polyester with several small 50D No-See-Um-Mesh sections. All seams are waterproof taped. The vestibule has two windbreakers on the sides and a rather narrow door with two parallel zippers. So you roll it up and fix to the pole, see the picture below. There are shock-corded toggles which you attach to the loops above the door. The area is large enough for preparing meals and also to store your boots and packs. The door rolls above the entrance. One of the three vents. There are two vents on the front area and one on the rear end (shown in the picture above). They are matched with the small mesh sections mentioned above. Because of the front vestibule, you can always add more circulation by opening the inner door. But all the vents can also be closed to preserve the warmth in the case of a cold weather camping. The inner mesh sections cannot be closed and this is why I hesitate to call it a true winter tent. If you want something like this, check some tents with a convertible design like Eureka Mountain Pass 2 or Slumberjack In-Season 2 Tent. There are 5 huge pockets on the sides of the tent. This tent is flame-retardant, it satisfies flammability requirements of ISO6941 (EN5912). Carry bag is included, see the picture. The inner door when unzipped stores in a pocket next to it. This is Scorpion 3 tent packed. A bit heavy for the trail. The current price on Amazon is around $250 and this is a real bargain. But if you check on the EU market you will see it is around 500 Euro. Weight: 7.5 lb (3.4 kg). Trail weight (fly, poles, inner tent): 6.46 lb (2.93 kg). Dimensions: 128 x 77 in (325 x 195 cm). Inner dimensions: 87 x 69 in (220 x 175 cm). Inner area: 35.5 ft² (3.3 m²). Inner area per person: 11.8 ft² (1.1 m²). Vestibule area: 11.8 ft² (1.1 m²). Total area per person: 15.8 ft² (1.47 m²). Inner peak height: 45 in (115 cm). Height: 51 in (130 cm). Packed size: 17 x 8 in (43 x 21 cm). In the table below I give the Scorpion 3 side by side with two other tents that are designed for winter conditions. As you see it offers far less space than the other two that are also 3-person tents. It is heavier but it is also a bit taller. But this tent you can get for less than half the price of the other two tents (if you are in the US). 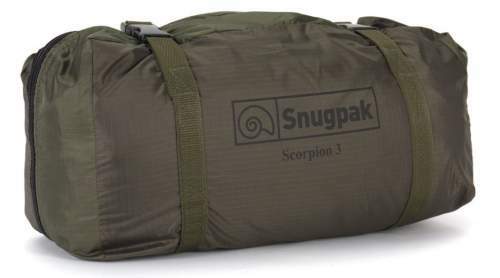 So this Snugpak Scorpion 3 tent is really nicely built, reliable and versatile it is designed to protect you from severe weather conditions, and it has been tried and tested in the past years. But it is best to ignore the declared capacity and use it as a 2-person tent. If you need something for three people you might want to check their Snugpak The Cave 4 Person Tent which is also for cold weather camping. Note that this is not a sponsored text and I am not paid by the brand. Please share your thoughts about this tent, there is a comment box below.